An extremely brief and summarised background information about Albania while we wait for our plane in the airport, skip down if you find it boring! Enver Hoxha was the man who imposed a particularly harsh communist regime onto Albania, one where the ideals of Stalinism and oppressive isolationism continued long after other Eastern European countries relaxed their political ideals. National unity and self reliance were the aims, and Enver was ruthless in their implementation. 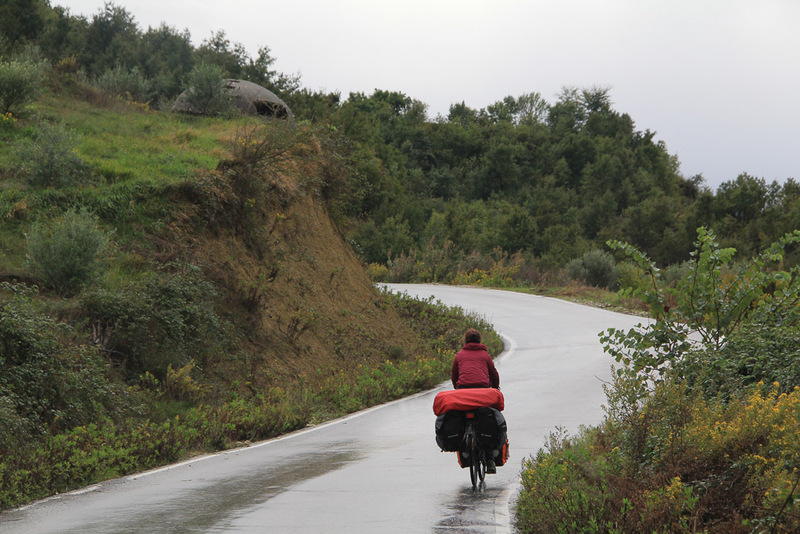 It was virtually impossible for outsiders to visit Albania, and even harder for Albanians to leave. 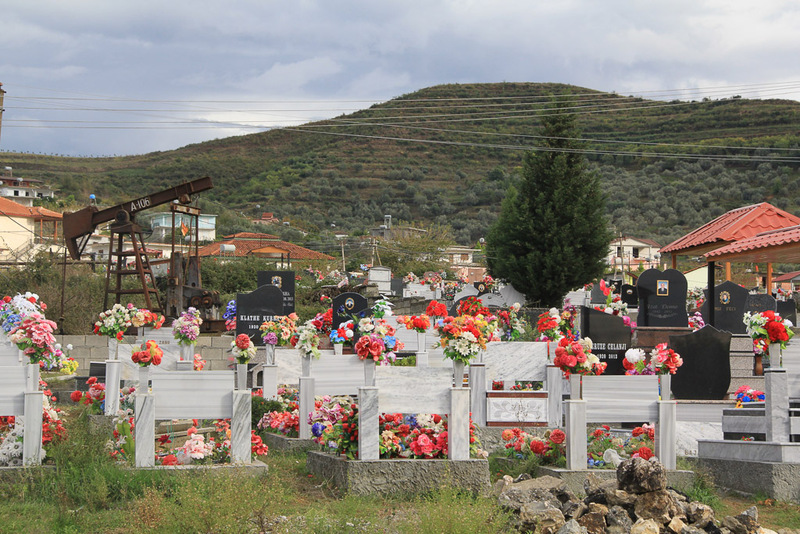 Anyone who didn’t fall in line with the narrative of the time was purged from the party – even the Russians were surprised at the ruthlessness of the Albanian regime – thousands of people were disposed off never to be heard from again, something which continued well into the 1980s. In summary, relations with other communist countries slowly deteriorated one by one as Enver considered their pathway to have deviated away from the original Stalinist ideals. First they fell out with Tito and Yugoslavia, Hoxha felt that Tito was trying to incorporate Albania into the greater Yugoslavia project and that Albania would get a bum deal. This was in the late 1940s – they wouldn’t be friends again. This led to closer ties to Soviet Russia, Hoxha was happy with this as Russia was at enough of a distance to not exert too much direct political pressure on the Albanians. Money was given by Russia for development and a period of growth was experienced… however it wasn’t to last, Stalin died and Krushcev policies of ‘de-stalinization’, ‘peaceful coexistence’ and support of Tito led to the second fallout – no love for Russia. What followed has to be one of the most bizzare of geopolitical relationships in Europe, Albania became best of buddies with the Chinese during the Sino-Soviet split due to perceived shared beliefs of ‘Soviet revisionism’ away from true Marxist/Leninism. Although almost all of Albania’s trade and foreign investment came from Russia, Hoxha broke ties to form a closer relationship with China, resulting in a near collapse of the economy. The Chinese responded with money, food and industrial equipment on terms that were more favorable than the Russians had offered – Chinese advisors even lived on the same low pay as the Albanians, something the Russians had refused to do – the only problem was that Chinese things were basically crap copies of what the Russians had offered, and that speaking to each other was almost impossible… so they communicated in Russian. Eventually they even turned their back on the Chinese, partly because they were considered revisionists after their engagement with the USA (Nixons visit) and the reforms taking place in the late 1970s. By 1980 Albania really had no friends. With Albania’s desire to transform its peasants to proletarians, Hohxa was desperate for industrial production and material self-reliance. There is very little about it written online, but in the late 1960s/ early 1970s ‘Steel of the Party’ was the largest joint industrial project undertaken. It was considered so important to Albania it was called ‘the second liberation of Albania’ by Hoxha and employed 15,000 people in its heyday. By far the largest industrial complex in Albania, it was huge. Vast amounts of different materials were processed within the coal coking, carbonate, cobalt, nickel, chromium, pig iron, carbonate, rolling mills, air separation units and chemical plants. Surrounding this was a selection of other delightful industries such as battery storage, ferrochrome and cement production. Due to limited technology (the Chinese were not particularly advanced back then) and a lack of environmental awareness/care, there were few protections for the huge amount of by products such an industrial undertaking would create. This is the legacy which has plagued the region of Elbasan since resulting in an area that is considered one of Europe’s most polluted. Studies from the 1990s onwards have shown the area to have much higher levels of diseases, cancers and genetic mutations than the rest of Europe. A UNDP report in 2003 stated that over 12 years, six million tonnes of iron and nickel were worked, 25% of which was discharged into the air. Two million tonnes of heavy metals were discharged into local rivers and the soil within the valley is contaminated to a depth of 30-50cm. As a result fruit, vegetables and meat have levels of toxic materials at levels far beyond what is considered healthy and no one knows how much it would cost to even attempt to clean up. We were under the impression that ‘steel of the party’ closed following the collapse of communism and that it would be one vast abandoned factory complex that we could explore as we cycled past. From a distance this looks to be the case, almost every window is broken on the huge industrial buildings and wild vegetation fills the gap between them. Rusted metal sticks out of the ground everywhere, with whatever it previously supported long gone. As we cycled closer the acrid smell, glimpses of fire and sounds of machines filled the air. Far from being abandoned various international companies have bought fragments of the vast site and are still using it, although they seem to have not paid anything to maintain the crumbling buildings. The new crowd have not been much better; Russian, Libyan and Turkish companies are thought to be pumping huge amounts of waste into the local environment. The steel production, recycling and rolling mills were bought by Kurum, a Turkish company – most of the material they process comes from outside Albania, bought from the port of Elbasan on huge trains, further adding to waste in the area as mercury and other contaminants slip through due to minimal checking. The government has ensured filters and scrubbers have been fitted to reduce harmful emissions, but local technicians claim they are only used intermittently, ie when government inspectors visit. 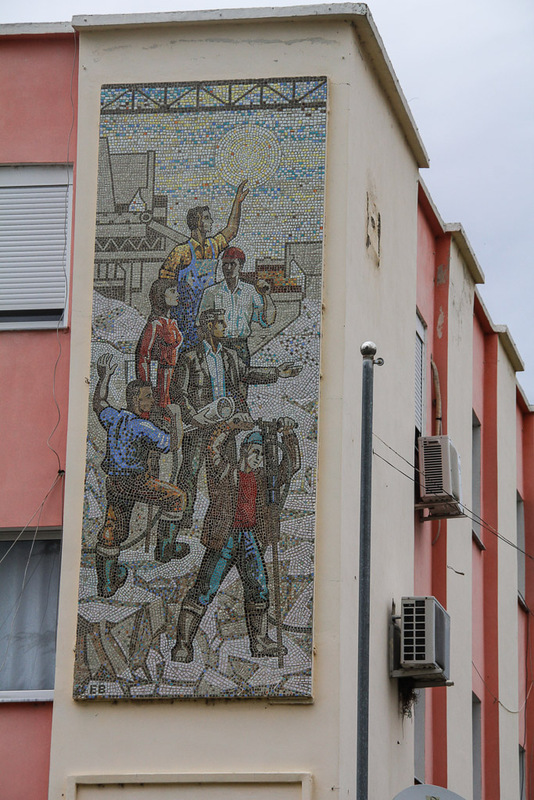 Despite the collapse of communism, conditions are still grim for residents of Elbasan. The air quality is ten times worse than the permitted tolerances of the EU, cancer rates are also ten times higher than any other region of Albania. Oil. 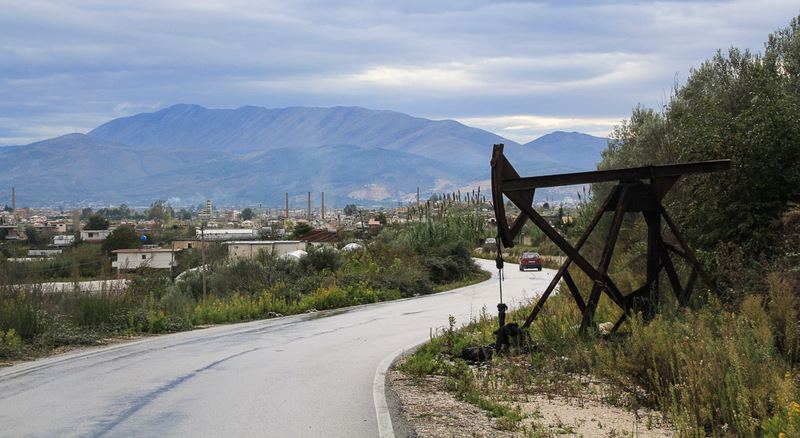 We had no idea that Albania had anything to do with the extraction or processing of oil, but it turns out they do… they actually have quite a lot! Europe’s largest onshore oil field is situated around the area of Fier with proven reserves of 2 billion barrels, just down the road is another field with 300 million barrels and 2 billion are situated just off the coast. So Europe’s second poorest country has some of the continents largest petroleum deposits…. You would think they are extracting them at breakneck speed, taking advantage of what were record oil prices to pump much needed cash into their weak economy right? With at least 4 billion barrels available how much do you think they are extracting per year? If we said 5000 bbl/day you would think we were joking, but that’s it! That is less than HALF what the well-known oil producing country of Belgium (11,200bbl/day) extracts! The largest field has been tapped since the 1930s, but the political situation has never really allowed large scale investment, first a closed country and then rampant cowboy capitalism rife with corruption and shady deals has seemed to scare most companies away. There have been many attempts to attract investment, a few oil companies seem to have tried to get involved but the oil is viscous and difficult to extract – however taking more the 5000 bbl/day shouldn’t be difficult. Instead a steady slow trickle flows through ancient, rusting equipment providing little money to the government. 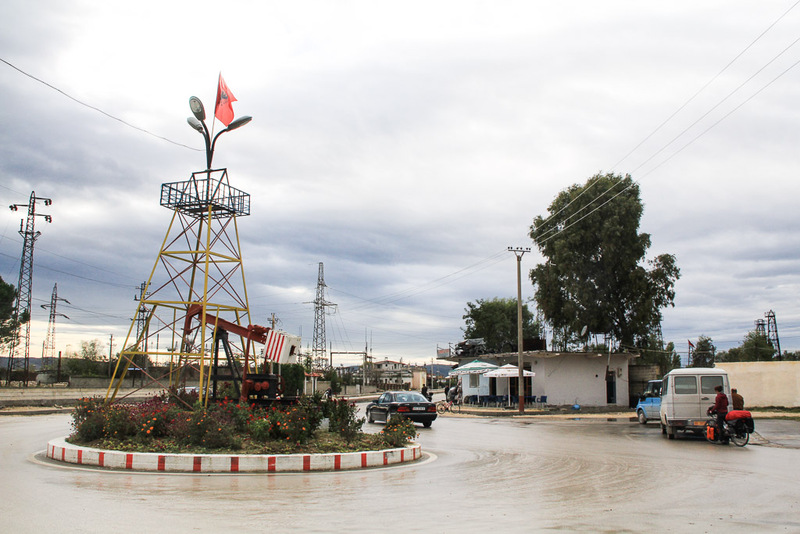 We have never been to an oil producing area before, perhaps they are not all the same but what we saw around Kucove was truly shocking. Halfway through our day we crested a hill with an amazing view down a particularly nice valley, green with many small farms. On closer inspection we realised the whole landscape was covered in many ‘nodding donkeys’, small mechanical pumps taking oil from the ground. Most of them no longer seemed to be functioning, their pump arms sagging miserably towards the ground. As we cycled down towards them the smell became unbelievable, a strong stench of hydrocarbons that made me think my fuel bottle lid had come off spilling fuel on my bike or myself – it didn’t seem possible that such a smell could come from a material that is presumably going straight from the ground into a pipe. 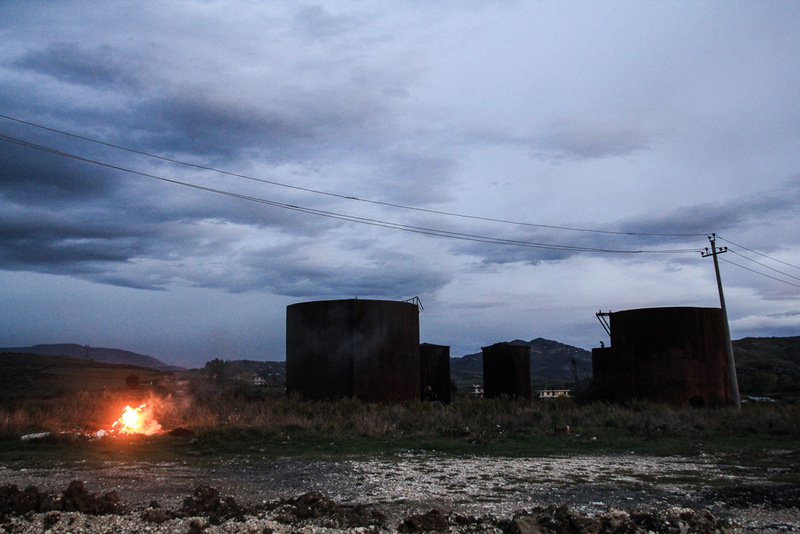 As soon as we were close enough to approach one we did, thick dark oil was sat pooled on the floor in a circle at least 3 meters around its base, the single barrel to collect the fuel was lying sideways, its contents all over the farmland next to the pump. We continued to pass many more like this, oil oozing down gullies and into rivers, over farmland and over roads – we couldn’t believe the mess and it conjured up Greenpeace images of environmental destruction in the Niger Delta. 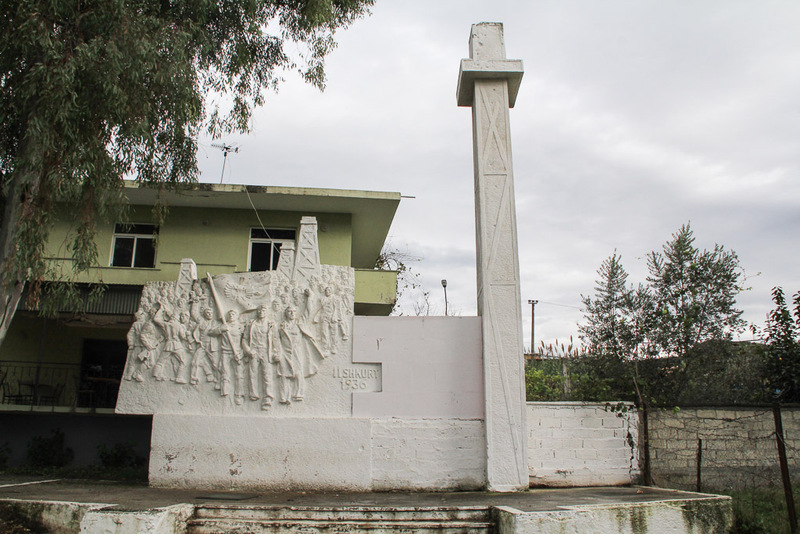 Kucove was the town at the centre of this mess, large communist memorials depicting stern, stocky, idealised workers with their derricks. There were pumps spread everywhere across the town, even in the graveyards! 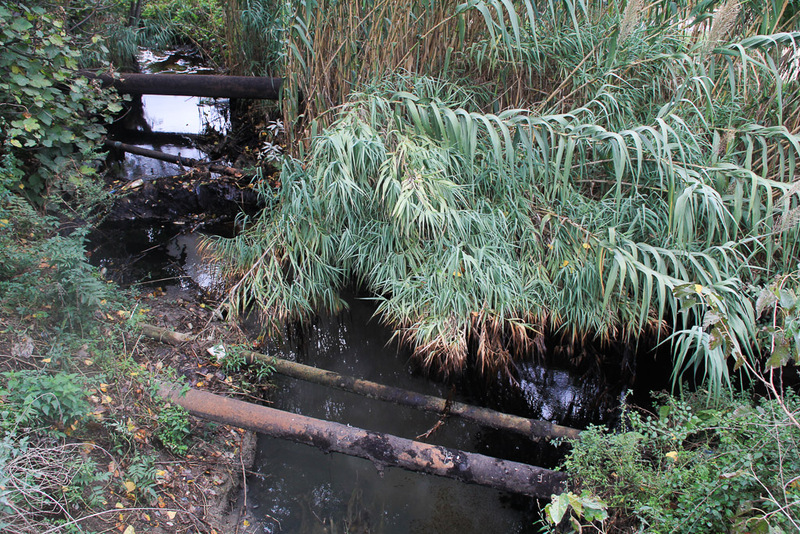 All of the irrigation channels or small streams surrounding Kucove were filled with dark oil and its strong accompanying smell. 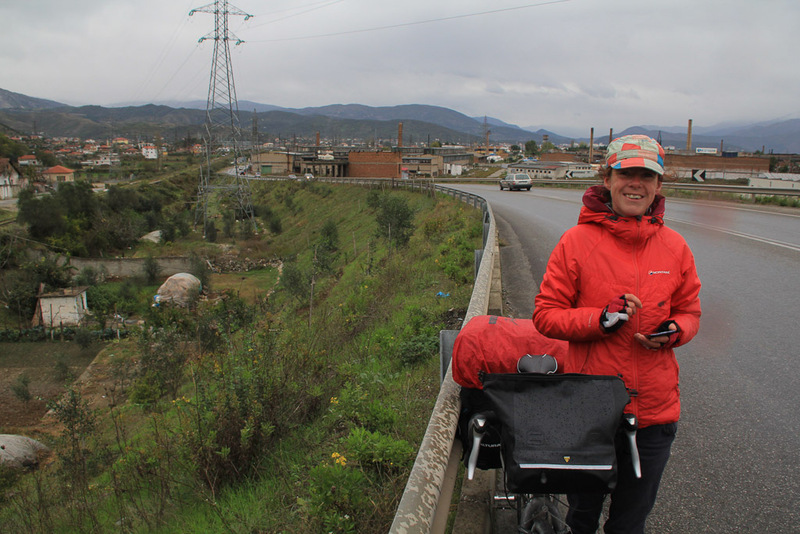 You would think that the town central to one of Albania’s few foreign currency earning industries would be well connected to the rest of the country, but the roads from Kucove were the worst we had cycled on so far. There was no upper surface and they were extremely potholed making our progress minimal at best. We continued to pass a landscape severely scared by industry; oil spills, fires, broken equipment and the unending volatile stench but our progress was so slow, jarred by the awful road surface. 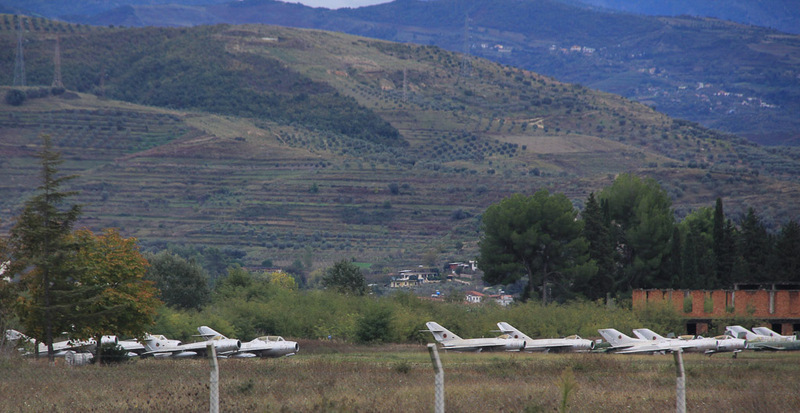 We passed another of Albania’s ex-air force bases, this one with its rusting, decaying planes sat out on the disused runway guarded with a solitary soldier with only a flock of sheep and a soldier for company. I stopped at the fence to take a photo, but an old man waiting for a bus started shouting at me in fast jabbing Albanian, the only recognisable words related to the police… they were hardly top secret so we continued much to his annoyance until his shouting became too much. With only a few bad shots we left giving him the satisfaction that he had scared western spies away from his beloved (grounded) air force. Despite setting off at 8.30am and the distance being only 95km, we hadn’t reached Fier by nightfall. We had to cycle the last hour in the pitch black, using only our head torches to see where we were going along roads that looked and felt like they had been made using artillery. Despite being an interesting day it was beyond difficult, we were completely exhausted and broken. Once again we hadn’t eaten a proper lunch, realising we were pressed for time we just carried on which left us both absolutely starving and in a tetchy mood when we had to cycle in the dark. We had emailed a hotel in advance and agreed on a discounted rate, however when we arrived they refused to honor it. After showing them the email with the conversation and the cheaper rate they denied all knowledge of sending it despite it only being 20 hours before! Eventually, after more messing around than is desired after cycling 95km, being tired and hungry and wanting nothing more than having a shower we were given our key at the rate originally agreed the day before. The whole town felt as if someone had just sprayed petrol all over it and in our room the smell of petrol was almost unbearable, we really thought there had been some kind of disaster and the place would explode at any minute. The large open window offered a view over the town’s river, a black treacle flow of crude oil creeping past, its surface reflecting in that pearlesque way when oil tries to mix with water. The remainder of the evening was filled with a fast food binge so disgraceful it would upset a Teesider, in complete disregard to our health (who cares when we were in a town that smelt like the inside of the Exon Valdez) we ordered (and ate entirely) three twelve inch pizzas, a sufflaque (basically a doner kebab) and a large portion of greasy chips. Although our day was painful and we found it difficult we always put our situation into perspective afterwards, we experience many things that remind us how completely grateful we are for where we are from and what we have at home. It is almost certain that all of the people living in the areas we passed through have no control over what has happened or what is happening to the landscape around them. There is no doubt that people lives would be cut short from what is around them, with no option to move or no way to make those responsible accountable it must be difficult. 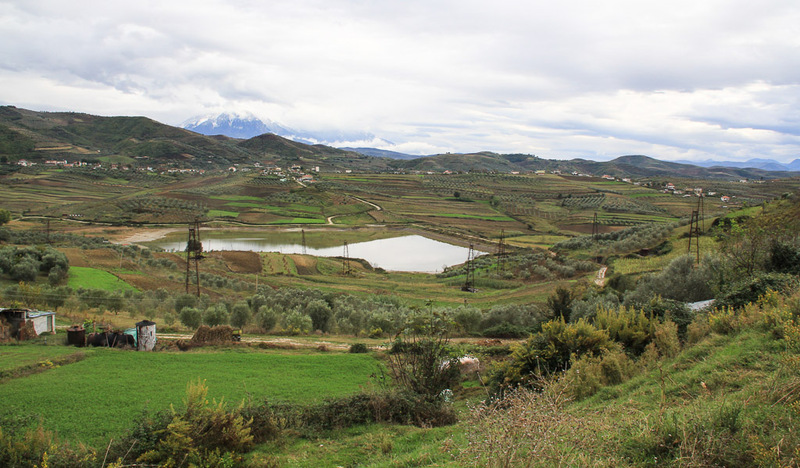 The power of the state is very weak in Albania, any environmental movement would be largely powerless to act in a country where money and muscle decide politics.